Written by Janet Choi on February 26, 2015 . As I looked at my monthly credit card bills, I knew what had to be done. I had to turn off 1-Click ordering on Amazon. The conventional rule of creating a great product is to remove all the friction in the user experience. 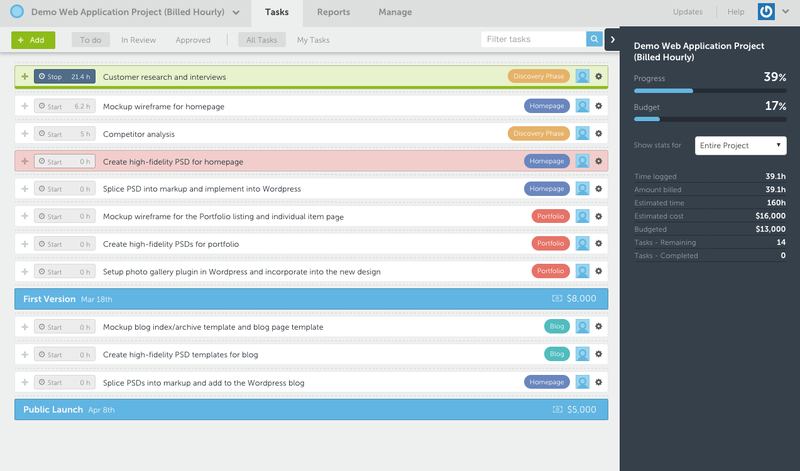 Make it easier to get stuff done at a push of a button. Friction, bad! Fast, good! Let’s take my personal finances out of the equation and look at the buy-now action that Amazon popularized. It’s the very model of a frictionless experience. See, like, want, buy, done. Generally, people just want to get to their desired result — whether it’s to be entertained, feel more organized, learn something, or buy socks because you don’t want to do laundry. And they’ll be more likely to use your product if you help them reach their result and stay out of their way. Friction is often your obstructive culprit, especially at that reluctant stage of new user inertia. That’s why so many sites and services use social logins using Facebook, Google, and Twitter to sign people up with one quick click. But is the one-click, quick-push method always the smartest choice? Sometimes you need some friction to help people stick around rather than slip away. Lumosity discovered that a little bit of friction is valuable in the long run. Getting the sign-up flow for an app or website is crucial, which is why so many use that minimal 1-click approach. Enter an email address — or better yet, click to log in with social — and boom, you’re in. 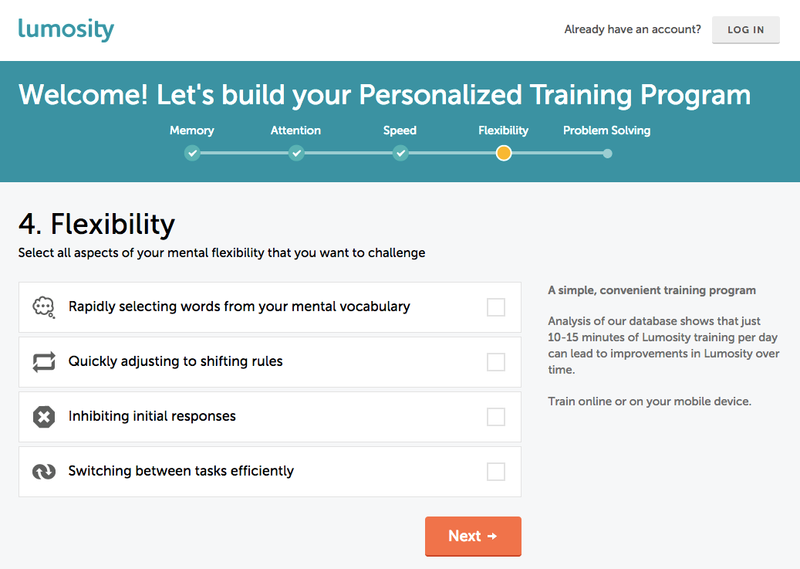 Lumosity decided to put this convention to the test, experimenting with sign-up flows with various levels of complexity. They found that having people answer questions led to fewer sign-ups, but as Sushmita Subramanian, Director of Product Design, explains: “those people who made it through were more valuable — people who were willing to invest in our product, who would pay to subscribe, who would continue to use it for a longer period.” The current sign-up flow takes you through 5 survey questions before you can even enter your email address. Once you do, there are 2 more screens with even more questions on demographic and personal details, such as education level and how much you sleep. Still not done, you then take a “fit test” to “calibrate your starting point.” This is friction as intentional design. As Subramanian says, “What we found is that sometimes friction can help you acquire customers that really believe in your product, who want to build a long-term relationship with your company.” At the end of the day, you want to prioritize having more customers rather than having more sign-ups. You must revisit the way you onboard new users if you drop card requirements. It’s not that you get crappier users when you drop the card requirement; you get less informed users. Remember, it takes a combination of motivation, ability, and a trigger to enable behavior change, according to the Fogg Behavioral Model. A trigger nudges you to act — but whether you actually do take action relies on your level of motivation and ability. Friction can impede both motivation and ability. If you have to trudge up an enormous hill to return a library book, you’ll probably procrastinate. However, friction can boost your motivation if it’s for your benefit. 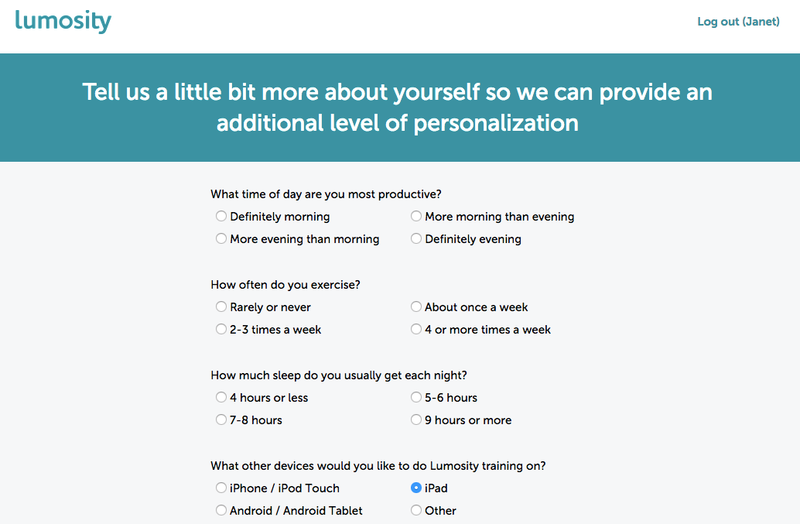 Lumosity emphasizes the personalization angle of its survey questions, which ultimately gets people engaged and invested enough in the app to pay. The friction here is intentionally framed as beneficial for the user. The result —10% higher subscriptions than without friction. The takeaway is to make any points of friction purposeful. Does it serve the user or provide value to you in the long run? 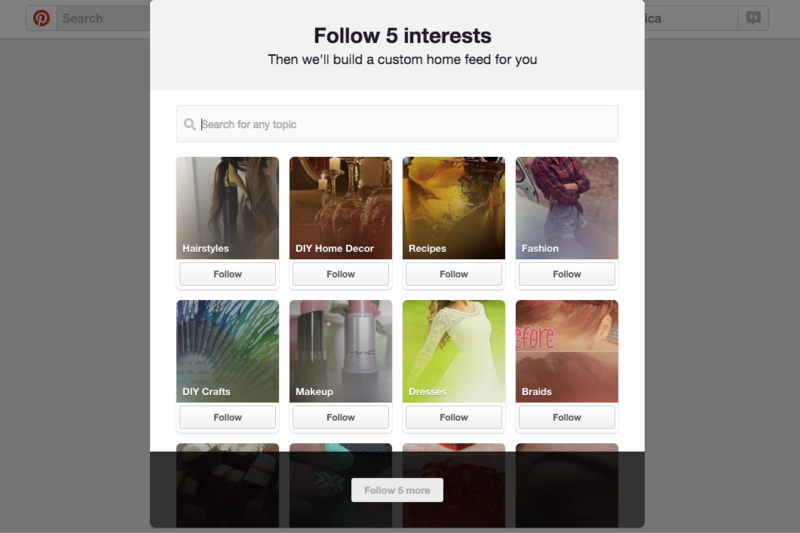 Like Lumosity, Pinterest deliberately inserts friction into its user signup flow. While their first step starts with entering an email address and name, they then ask you to choose 5 topics of interest to follow. Like Lumosity, they frame this as a personalization step to “build a custom home feed for you.” The flow then asks you to install the Pinterest browser button — and even if you choose to skip this step, they don’t let you proceed without another insistent nudge. If you complete these screens, you’ll also find three emails in your inbox — a confirmation email to verify your address plus two others that provide education and tips about how to use Pinterest. 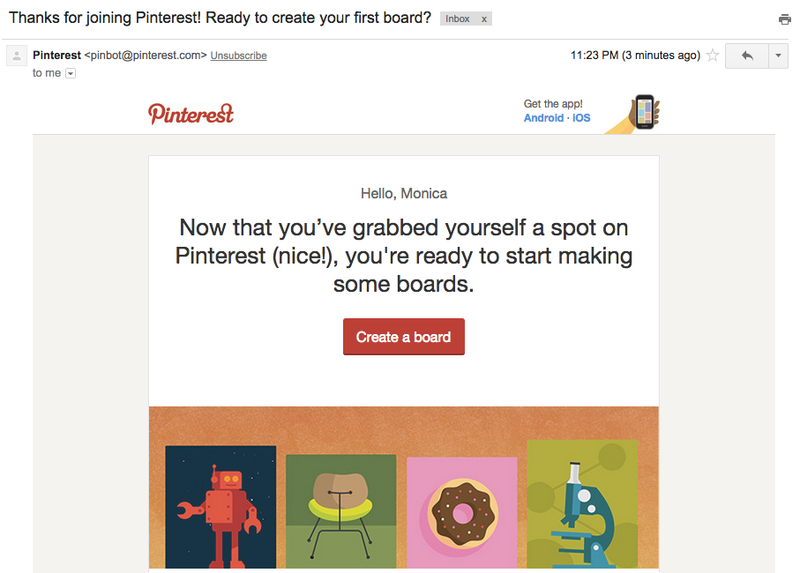 Pinterest understands that the up-front friction of receiving multiple emails, filling up a custom feed with existing content, and downloading a tool to pin or save content helps activate new users. All this just to get started reduces counterproductive friction down the road. Anyone who handles social media for a business understands the struggle to feed the never-satisfied monster of your social feeds with content. Buffer understands that pain and offers a solution that not only keeps users active (making the company happier) but also helps them accomplish their goals (making customers happier). It’s a win-win. 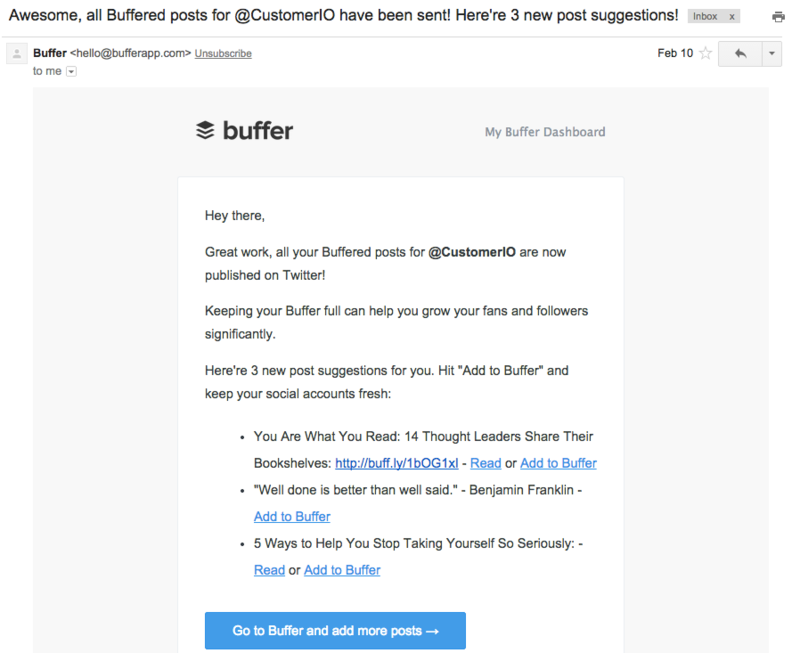 When your scheduled posts run out, Buffer not only sends you a quick email nudge to fill up your queue but provides 3 post suggestions to reduce the friction of having to find new content to share. A quick click on “Add to Buffer” lands you directly in your account with the post set up, and all you have to do is press a button to add it to your queue. This double-duty nudge, keeping you actively using the tool and removing a barrier to content creation, is a genius friction-removal tactic to keep up momentum. It’s like knowing when to give somebody another push on the swings to keep them going. Planscope calibrates friction in its signup flow carefully, inserting deliberate extra steps on the one hand and removing barriers on the other. 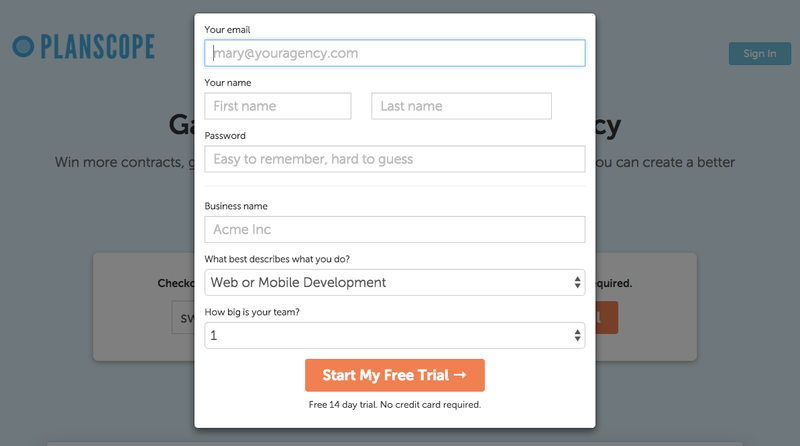 At first glance, Planscope’s signup process looks like the 1-Click variety. Enter email address to open sesame to the product right away. Upon entering your email address, though, you have to provide some more information — including details about your business, such as what field you’re in and team size. That helps Brennan and his team know who is a qualified lead (that will stick around and find Planscope’s project management tool useful) and reach out accordingly. 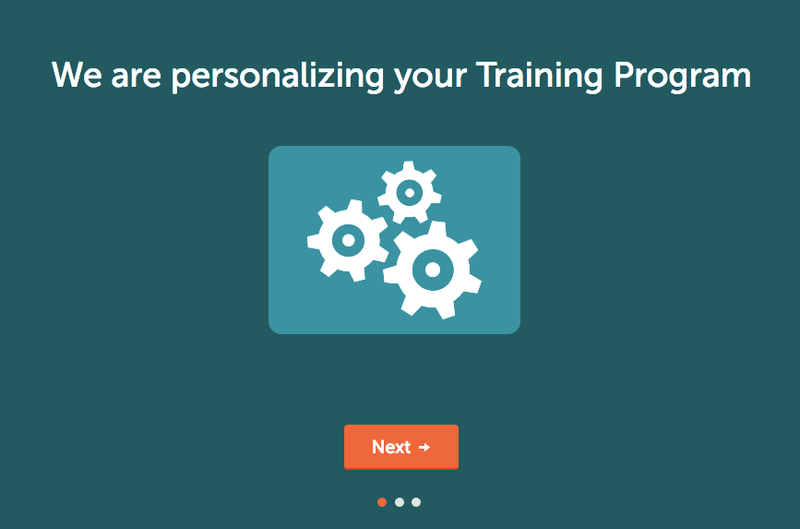 This mini-survey also personalizes an onboarding process, where the friction of not knowing where to start is removed. 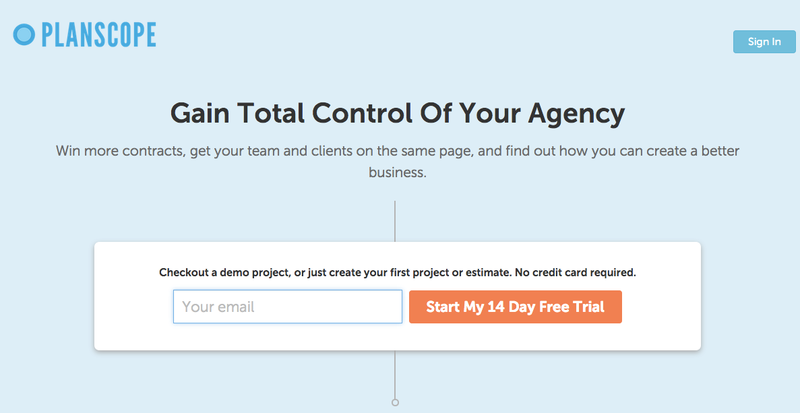 After completing the sign-up flow, you’ll see a demo project — that corresponds to the field of work you’ve chosen in the sign-up flow — already in progress with tasks, time, and budget already filled in. This sample material provides a mental shortcut to understanding the possibilities of the tool and learning how to use it. For example, when I created my first project, I didn’t quite get the distinction between Task Group and Task Name, and referring back to the demo data helped me figure it out in seconds. Creating a completely frictionless experience might mean that people sign up and then slide right on through to inactivity and cancellation, like a slippery bar of soap. Instead of simply identifying where friction appears in your user journeys and stamping it out, examine where you want to intervene with a trigger or put the brakes on the speed of the journey and why. It’s a matter of purposeful design as well as continual recalculation and recalibration to get everyone — and your business — where they want to go. Have you ever seen other successful examples of calibrating friction? We’d love to hear your thoughts and stories in the comments.